Chateau Backpackers & Motels offers a range of private motel rooms and high-end luxury dormitory rooms. 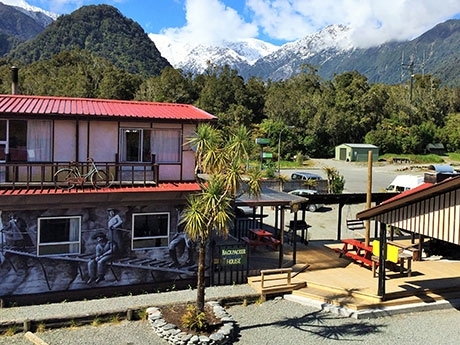 Chateau Backpackers & Motels is located on Cron Street in Franz Josef, just a 5-minute drive to the glacier car park. Book your Franz Josef motel or backpacker accommodation online right now. Perfectly located, nestled in a rainforest, Chateau Backpackers & Motels offers the ultimate budget accommodation. All rooms include free unlimited WiFi, free breakfast, free soup, free international phone calls and a free spa pool. We offer motel rooms with luxury queen-size beds, kitchenettes and ensuites. These rooms are the perfect solution for those who want privacy but are travelling on a budget. We also offer backpacker rooms with beds set out in pods to ensure that all our guests have the privacy they require after a day hiking on the glacier. The pods are enclosed on three sides with a curtain for privacy and include a double power socket with USB charging points and individual reading lights. Chateau has a selection of pod room sizes to accommodate up to 9 persons. Located on Cron Street in Franz Josef and a 5-minute drive to the glacier car park, Chateau is only a couple of minutes' walk to all of Franz Josef's facilities and tour operators. We can also help you to book your Franz Josef tours.